Indonesian badminton fans turned up in droves and the atmosphere inside the Istora Senayan Stadium in Jakarta was electrifying - all for the love of their best women's doubles player Liliyana Natsir. The 33-year-old Manado-born Indonesian played her last international tournament and this was the USD350,000 Daihatsu Indonesia Masters which ended on Sunday. Together with partner Tontowi Ahmad, Liliyana Natsir reached the mixed doubles final which was against World and Asian Games champions Zheng Siwei-Huang Yaqiong from China who went into the final with a 3-1 advantage in the head to head count. The Indonesians who reached the semi-finals in the same tournament last year, made a head start in the final by winning the first game 21-19, and were well placed at 18-14 in the second. However, while the pressure built up on the Indonesians, the Chinese top seeds found the rhythm and reeled off seven points in a row to force a decider with a 21-19 win. The Indonesians, who won the 2016 Rio Olympics mixed doubles gold - the first Indonesian pair to win the Olympic gold in the event - could not sustain the momentum in the rubber and went down 16-21. As the curtains came down on Liliyana's illustrious badminton career, emotions ran high, both in the stands and on the courts. 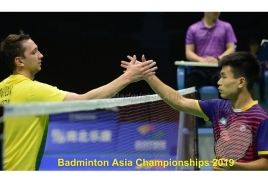 Tontowi and Zheng Siwei-Huang Yaqiong gave Liliyana warm hugs as tears rolled down her cheeks. It was the final of the day at Istora Senayan and Indonesians bade farewell to Liliyana - a four-time world champion (with Widianto twice and Tontowi twice) and three-time All England champion with Tontowi. Many had hoped for a perfect farewell present for Tontowi-Liliyana by winning the mixed doubles in her home tournament - but it was not to be it. Still, Liliyana will be remembered for her contributions to the shuttle sport in badminton mad Indonesia. Zheng Siwei-Huang Yaqion retained the title which came with a USD27,650 in prize money while the losers took home USD13,300. Still, Indonesia had winners in the men's doubles. Earlier in the women's singles final India's Saina Nehwal, runner-up to Tai Tzu Ying of Chinese Taipei last year, took the title when Spain's Carolina Marin retired after 10 minutes of play through a right knee injury. Marin was leading 10-4 at that stage. A concerned Nehwal put the injury to Marin aside and said: "Indonesia is one of my luckiest place and I have played eight finals here. Would like to come again next year and see how it goes." Nehwal pocketed USD27,650 in prize money while the loser settled for USD13,300. In the men's singles Denmark's Anders Antonsen upset world champion and top ranked Kento Momota 21-16, 14-21, 21-17 in a marathon 79-minute final. Japan's Olympic champions Misaki Matsutomo-Ayaka Takahashi retained their women's doubles title, defeating Korea's Kim So-yeong-Kong Yee-hong 21-19, 21-15 in the 43 minutes final.